For Dutch food and beverage (F&B) businesses, improving margins is a constant challenge and breaking out of the commodity trap is the name of the game. Increased food and drink standards and regulations have resulted in record levels of product recalls (as a result of food contamination and supply chain scandals), than ever before. In an age where competition is paramount, due to the proliferation and adoption of internet technologies, the opportunity costs associated with negative reputation or brand damage can significantly impact financial stability and hinder competitive advantage. Consumers increased use of technology and greater access to foreign markets has encouraged the growth of direct-to consumer distribution models – such as Nespresso and Naked Wines. This has resulted in increased competition enabling offerings that keep the cost of sales low by subverting the traditional retail path. Those that have not yet made the move to direct-to-consumer are constantly battling with retailers which are always demanding lower prices, to fuel the price wars they themselves are engaged in. Today’s consumers are typically driven by value-for-money, making decisions based on affordability. ‘Convenience’ and ‘online’ will be two crucial factors for manufacturers and retailers alike as customers seek not only cheaper, but easier, alternatives. Between 2009 and 2012, margins fell from 4.4% to 3.1% (according to Boer & Croon) and in 2013, margins dropped below 3%. This is before goods or services even hit the shops. Dutch F&B Manufacturers face further margin erosion from large food vendors and supermarkets, due to increased monopolization of the local market, on which they rely to reach the end consumer. Reaching these new markets requires significant investment, a constant flow of innovation and a healthy level of capital and/or cash. From our experience a typical reaction to this challenge is to look internally first, build out vast areas of capability and resources, bring in new technology, create systems and processes to pull everything together and spend the next 5 years refining and optimizing - all of this costing the business a large amount of time, money and valuable resources. Although this approach may work for those areas that directly influence the core elements of the business (R&D, production, operations, IT etc. ), there are other facets of the business that are significant opportunities that remain dormant or hidden to many executives, which may help shift the buying / selling power back in the favor of the manufacturer. Henry Ford once said “a business, in my way of thinking, is not a machine. It is a collection of people who are brought together to do work”. This quote no longer holds true. It should read “a business, in my way of thinking, is not a machine. It is a collection of people and suppliers who are brought together to do work”. F&B businesses are especially aware of this – and have spent years engineering their supply chains to optimally produce their core goods and services. Technologies, processes and business models have been embedded into every aspect of the supply chain, ensuring maximum cost benefits and efficiencies have been driven out. However, in the area of non-commodity, it’s a different story. 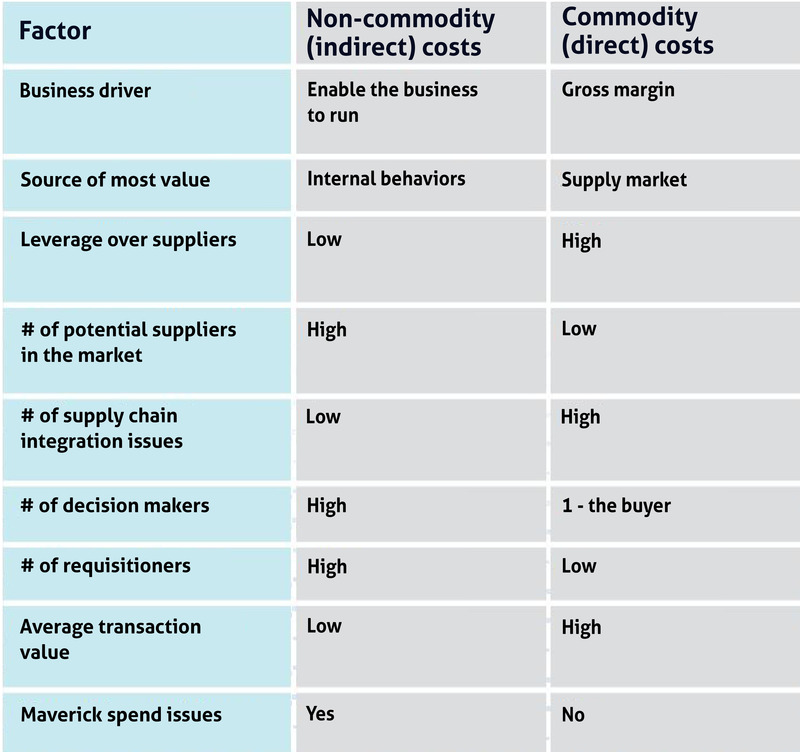 The approach many F&B manufacturers have taken towards optimizing non-commodity (indirect) costs is to simply overlay the rules, processes and methodologies applied to their supply chain (direct) costs. The problem is, given the fundamental differences between these two areas of spend highlighted in the table above, this does not have the same results. For example, supply chain professionals will typically be specialists in the categories they are responsible for sourcing. They will have strong influence over the specification, input into design and a clear understanding of how / where the commoditized goods and services will be used. They are usually buying high value, low frequency items and are limited to a relatively small world of supply. The absolute inverse is applicable for non-commodity professionals. They are often generalists, responsible for managing several categories on behalf of internal stakeholders (IT, Marketing, Finance etc.). They are typically brought in at the last minute to negotiate a contract and have limited to no input around specification or design. They usually buy low value items and have no insight into the consumption habits of the various stakeholders. Managing non-commodity areas is a complex area that few businesses do effectively, and that’s a problem; because how well you manage your non-commodity costs impacts your business performance, your people’s productivity, your margins, innovation, exposure to risk and, ultimately, aids in breaking free of the commodity trap. I’d like to hear your views on breaking out of the commodity trap - what are some unconventional ways you have approached this topic? Please add your thoughts in the comment box below.